We'd like to take this opportunity to proudly share with you a small sample of some of the feedback we've received over the years. I had been searching for an Icelandic horse that would be both a good trail horse for me and a calm partner for my sensitive Icelandic mare. After visiting several Icelandic breeders and trying out many wonderful Icelandic horses, I still hadn't found that perfect partner. I contacted Steve and Andrea. They were welcoming and both served as a wealth of information on the Icelandic horse--and Steve has a talent for matching horse and rider. After meeting and riding Thor from Anacapri with Andrea and Steve, something clicked and it seemed clear that he would be an excellent choice for me. He has turned out to be my best horse, yet. Thor has such a great personality, and is very willing and brave. Steve and Andrea are honest and straightforward. They made the horse buying experience very easy and it was a pleasure to purchase a horse from them. Steve and Andrea, want to thank you both once again for all of your help in our purchase of Tia Maria. After you taking the time for several introductory rides/lessons, I felt she was an obvious first choice for us, with her wonderful talent, personality, adaptability and beauty on top of all of that. But with half of the purchasers living in Hawaii there were some stressful moments before we could make her ours! I know is was stressful for you too, with our decision coming in at what could have been the last minute. I truly appreciate your patience and understanding!! But oh how happy we are with her! She is everything we wanted and more! She fit right in with her new herd! You both are miracle workers when it comes to getting the right horse in to the right home! Come visit her and the others any time! I purchased Magni from Sand Meadow as a four year old, and he's now five and a half. I was looking for an Icelandic who had dressage-y gaits: a big trot, long-strided walk, and clear three-beat canter in addition to an easy tolt. I enjoy all the gaits, and all of Magni's are excellent! When I first rode him, he'd been shipped across the country to Kentucky and had a month of training under saddle. The arena was about twenty feet tall with metal siding, and construction was going on all around us. Magni, far from being concerned by a brand new rider, settled right into work, walking and trotting around with not even a spooky glance at all the chaos around him. Then, as we were walking past the giant metal doors, a crane accidentally smacked into them. The door rang like a gong next to Magni's ear. And all he did was stop and look. I have continued to be endlessly impressed by how unflappable and willing he is. He has one of the easiest dispositions I've ever come across. As a bonus, he's super friendly! He's first at the gate and stands around happily to be pet and scratched. He loves people and is fun to be around as well as to ride. To give credit where it's due, not only did the Barbers breed a wonderful critter, they handled him beautifully. He is utterly trusting, follows me around like a puppy, picks up his hooves and trailers like a pro (and has since the first day I got him). He's well-socialized and gets along in turn out with everybody. The Barbers also made a cross country purchase easy and pleasant. They sent me great video when I asked for it, arranged for me to see Magni while he was in training, and had every bit of paperwork in order (often before I asked for it). And Magni is exactly what I wanted. I am sending my deepest thanks and gratitude to you both for your assistance and care in finding new homes for our beloved mares Von and Tata! It means so much to my daughter Grace and I that our mares that have served us so well for so many years have new wonderful homes. I think you are definitely a credit to the horse world! Wishing you infinite love and blessings. What a fabulous ride we had! Thank you so much for all the thoughtful preparation and attention to everything that made for the perfect experience. We learned such useful, practical details, and gained confidence. I've never ridden so far or so fast (wimp that I am) and loved every minute! Thank you very much. Kalman frá Lækjamóti is my mare, Gifta from Four Winds', sire. Gifta is a beautiful and very talented mare. She inherited Kalman's exquisite looks and conformation, sweet disposition, and the elegant "Kalman" trot. Gifta is my forever horse. She is the best trail horse I have ever owned. I also perform with her in a drill team, at breed exposition shows, with 4-H clubs and kid's riding summer camps. Whatever I ask of Gifta, she always delivers 100%. I've had people tell me that Gifta is the most beautiful horse they have ever seen. In 2008, Gifta was the highest scoring young horse with a total score of 8.2. She had a perfect score her big mane and tail, just like Kalman. Gifta is 5 gaited and eagerly moves in all of her gaits. She is a very special horse, who has a very special sire, Kalman frá Lækjamóti. Thank you. Thank you both very much. I don’t usually feel as though I have to explain what that means. But the mere words just can’t convey my gratitude for so many things. First I thank you for letting me purchase Fenja! But there was so much that went in to that! Thank you for all of the information on Icelandics, the rides, the lessons on various Icelandics so that I could understand more than just the obvious differences. There are subtle things that I had not considered and you brought them to my attention. You helped me figure out what I wanted in a horse, what characteristics I especially appreciate in a horse. You advised me to request a pre purchase exam, you guided me through that procedure, reminding me of the questions to ask and tests to request from the veterinarian, all of which instilled a feeling of confidence that I had made the right decision. Boarding Fenja with you while she received her spring vaccinations and a thorough physical let me interview a veterinarian and arrange for him to see her at her new facility. The same with a farrier. A month of personalized lessons for me riding her also has set the stage for a successful transition. Having a 3 day clinic with Gudmar Petursson planned the same week that I was to take possession of Fenja was a stroke of pure genius on someone’s part! It has been a wonderful experience from the first ride to the farewell as we drove off! I consider you two and Fenja’s former owner good friends, not just people from whom I bought a horse. So thank you from the bottom of my heart! I just heard from Oskar's new owner, and she is in love with him! Thanks for finding such a great home for him. My friends questioned why I would send Oskar all the way to New York instead of placing him for sale locally, but that was an easy decision. Between your connections in the Icelandic horse community and your intuition when matching up people and horses, I knew he was in good hands. I cannot thank you and Steve enough for being your amazing selves and helping me with what was one of the most difficult moments and decisions of my life. Your care, attention and professionalism gave me peace of mind and trust to let Fenja go to someone else and for that I am eternally grateful and I thank you so very very much. 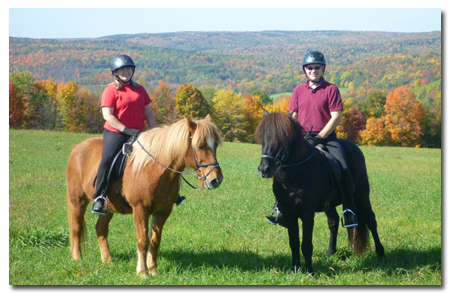 I have known Andrea and Steve for years and have never met anyone more passionate about the Icelandic Horse. When I first met them I was at a clinic in NY. I was severely over mounted on an older previously abused gelding. After I got dumped Steve stepped up and volunteered to ride my "crazy" horse while lending me his safe and sane one. I'll never forget the way he focused all his energy on that wild mount, working intently in one far corner of the arena while I got to enjoy the clinic on his sweet gelding. After the clinic Steve took my big crazy boy for training and worked wonders with him. More recently my husband was laid off and I was forced to sell my horse and trailer. Steve and Andrea stepped up again and not only found a great buyer for my unconventionally trained mare, but also found a buyer for my trailer! To this day I still get updates from my beloved mare's new owner. For the care they took in finding her the perfect home I will be forever grateful. Steve and Andrea at Sand Meadow have been my "go to" farm when looking for a specific type of horse. I describe what I am looking for and know that they will assist me to find the right horse. During my visits they spend time showing me horses, taking trail rides to try out horses and allowing me to spend time with the horses. I am so pleased with each horse purchased from them and enjoy staying in touch. I bought my first (and only) Icelandic from Steve and Andrea Barber. They care a lot about their horses, and were patient in educating me before the sale. All my questions were answered and I was provided photos , videos, and an opportunity to take a test ride. I would not hesitate to buy another horse from them, and recommend that anyone in the market for a Icelandic take the time to talk with them. I found Sand Meadow Farm while researching the Icelandic breed. I met their horses and took a lesson from Steve. It was such a positive experience that I did end up purchasing two Icelandics. Since these horses differ from others in many ways, Andrea and Steve have been a big part of my learning curve. Last summer I sent my gelding to the Barbers for some “tuning up.” They discovered that he didn’t have a training issue but a back problem. They were helpful in getting us on track to getting Litli feeling good again. While Litli was at Sand Meadow, we had their stallion Hrokur breed our mare, Randalin and we are anxiously awaiting a foal in July. I know that they will be there for me as we approach her due date and after our new addition joins our small herd. I just wanted to thank the both of you for such a wonderful ride last Sunday. It was one of the best rides that I have had on Kraftur. Steve, you are a wonderful and patient instructor....I learned more from you in one ride than I did in a week in Iceland. Again...thank you very much.